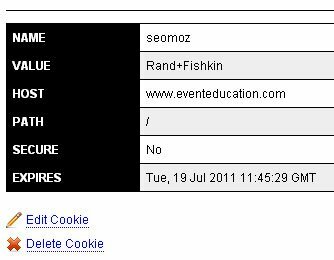 A cookie is a small text file which is generally used to identify a visitor as first time/ returned visitor or member/non-member visitor. When a user request a page from your web server the server may place/read this text file on a user’s hard disk. You as an SEO must know how cookies are created and set up. The setcookie() function is used to create a cookie. This function must appear BEFORE the <html> tag. ‘Name’ is the name of the cookie. ‘Value’ is the value associated with the cookie. ‘Expire’ is the time when the cookie should expire. For e.g. time()+3600*24*30 will set the cookie to expire in 30 days. If this parameter is not set then the cookie will expire at the end of the session (when the browser closes). ‘Secure’ is whether or not the cookie should be set over a secure HTTP connection. Its default value is ‘False’ which means cookie should be set up. The value of ‘True’ means cookie should be set up only if a secure connection exist. Note: Only ‘name’ and ‘value’ fields are required in the setcookie() function. All other fields are optional. Note: In the example above the expiration time is set like this: 1 hr(3600 seconds) * 1 day(24hrs)*1 month(30 days). So what I have specified is the total number of seconds in a month. I set up this cookie on my own website eventeducation.com. That’s why the host name is www.eventeducation.com. Note this cookie will expire after one month. We can also set this cookie to expire after 6 months or 6 years. This function is used to send a raw HTTP response header to a browser and must be called before an actual output is sent (in PHP 4 and above). ‘String‘ is the header string to send. It is made up of colon separated name-value pairs. For. e.g. “Cache-Control: no-cache”. This field is required. ‘replace‘ specifies whether the header should replace previous header or add a second header. Default is TRUE (will replace). FALSE (allows multiple headers of the same type). This field is optional. ‘http_response_code‘ forces the HTTP response code to the specified value (only available in PHP 4.3 and higher). Congratulations! you now know how to send HTTP status codes. Now you must be able to handle soft 404 issues. Click here to see the complete list of HTTP status codes. Place the following code on the page which you don’t want to be cached. You need to have basic knowledge of this module if you want to want to make static resources (like CSS, image files etc) cacheable. Through this module you can add Expires and Cache-Control HTTP headers to static resources and thus make them cacheable. This directive enables or disable generation of Expires headers and cache-control headers for a resource like images, CSS files etc. This directive defines the value of the Expires header and the max-age directive of the Cache-Control header generated for documents of the specified type (e.g., text/html). The second argument sets the number of seconds that will be added to a base time to construct the expiration date. The base time is either the last modification time of the file, or the time of the client’s access to the document. Which should be used is specified by the <code> field; M means that the file’s last modification time should be used as the base time, and A means the client’s access time should be used. In the example above all GIF image files will expire after 31104000 seconds (i.e. after year) from the time of the client’s access to the document. The Cache-Control: max-age is calculated by subtracting the request time from the expiration date and expressing the result in seconds. This directive sets the default algorithm for calculating the expiration time for all documents in the affected realm. It can be overridden on a type-by-type basis by the ExpiresByType directive. The directive in the example above set the default algorithm for calculating the expiration time for all documents from the time of the client’s access to the document to zero.